Dutch Wonderland's story began with Earl Clark, a local potato broker and hotel owner who saw the need for an attraction in the Lancaster area that would appeal to children. After almost nine months of construction, Clark officially opened Dutch Wonderland to the public on May 20, 1963. Like most parks, Dutch Wonderland started out small, but it soon became one of the biggest attractions in the area. Many groundbreaking changes were made to the park throughout its first years of operation, including the addition of a monorail, the International Botanical Gardens, and a wax museum based on the history of the Lancaster area. The 1990s saw the addition of two roller coasters: the Sky Princess and the Joust. For over 50 years, Dutch Wonderland has prided itself as one of the best family parks in the country. 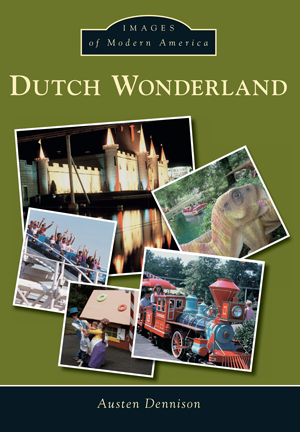 Dutch Wonderland will take readers down memory lane, telling the story of the park through images from its colorful history. Austen Dennison is an amusement park enthusiast and historian with a degree in art and design. He is also a collector of amusement park items and hopes to soon open a museum. Throughout the years, he has always felt a special connection to Dutch Wonderland and its rich history.